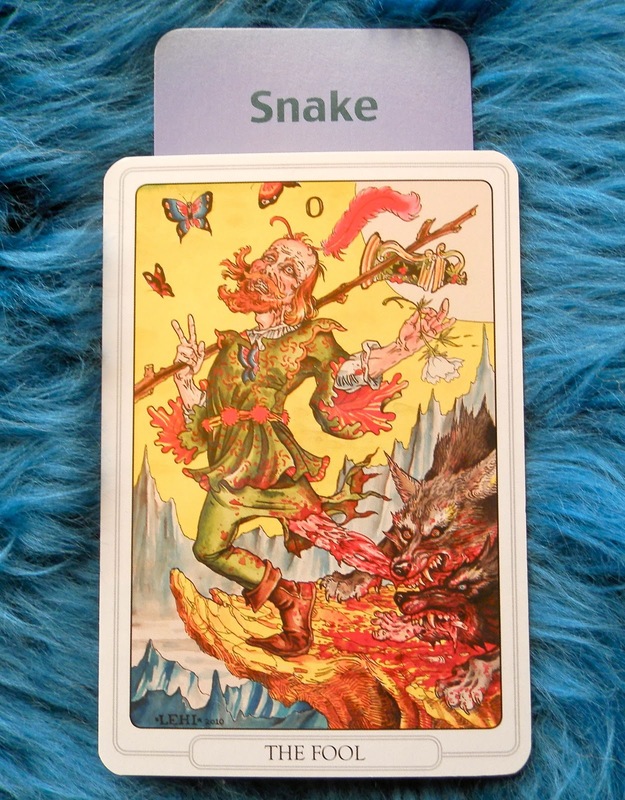 Today's Draw: Fool in the House of Snake from the Tarot of the Tattoo Age and my Deck of Lenormand Houses. Do you feel like you keep repeating the same cycles over and over in your life? Do you feel like you're being eaten alive by the hounds of hell? And are you just really tired of it? 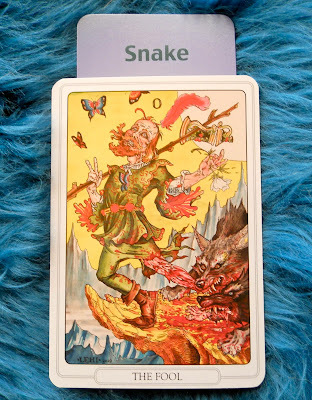 Usually when we see The Fool, he's tripping happily along the path with his little dog nipping at his heels unaware of the leap he's about to make. But this Fool is different. He's clearly drug addled, confused and being ripped apart by wolves. Which happens to fit nicely with the House of Snake...the house of lies and deception. What this pair reminds me of is that vicious cycle we get into where we keep repeating the same frustrating patterns all the time. For example, you keep encountering jerks on your path to your goal. Or you keep getting bosses that don't respect you. Or you seem to have friends that are always running late. It seems like the cycle is THEIR problem. After all, it's not anything you're doing. They're being the jerks, the disrespectors, the inconsiderates. Right? Well, um, no. This is where the House of Snake comes in. Because you're deceiving yourself. See, you're attracting these people into your life. You're allowing the behavior. They're mirroring SOMEthing back at you. It's possible your ability to clearly communicate your boundaries, needs and deal-breakers is even courting this kind of thing. Be gone by the time your late friend shows up a couple of times and she may start to be on time. Or lie to her about what time to meet you and see if that doesn't fix the problem. Or stop meeting her without another friend present and, when she does show up, tell her you were talking about her the entire time she was late..haha. Or just dump her disrespectful arse. You're not powerless over this stuff. Yet if you lament the presence of it continuing in your life without making any changes in your own behavior, you are playing victim to it. It's an ugly word nobody likes to cop to, but it's true. Problems don't exist outside of us. They exist within us. For every challenge that comes our way we have choices. How am I going to respond to this? Am I going to allow this to happen again? Is this acceptable? Should I just walk away right now? All of those are options. We don't have to respond the way we did last time this happened. In fact, we SHOULD respond differently, because that's the only way we can create change in the future. Some lessons happen fairly quickly and we stop the pattern in our life relatively painlessly. And some we shave away it slowly over a lifetime. I think these ones that keep coming back around in my life are like that. For me, they're about boundaries. And each time I make an adjustment, more respectful people enter my life. I'm learning those lessons in layers as I'm learning to respect myself. Turns out their disrespect for me mirrors my own. So if you wonder why you're always meeting jerks or people are always doing you wrong, its within your power to change it. It's probably a boundaries issue, but could also be a behavioral issue in that people get pissy with you when you get pissy with them, for example. And if you don't keep responding differently than you did last time to shave away at or change the cycle, then the problem's not with them at all. It's definitely with you.